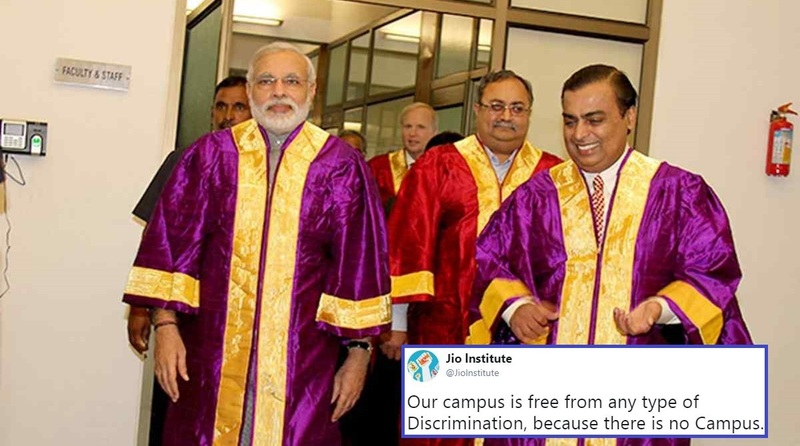 While the opposition voices are riled up, the ‘absence’ of Jio Institute has made its presence felt on the Twitterverse by triggering a deluge of jokes. Jio Institute was granted the ‘Institute of Eminence’ tag by the Ministry of Human Resource Development on Monday. The institute, backed by Mukesh Ambani’s Reliance Foundation, is one of the six granted the coveted tag which aims to elevate a total of 10 private and 10 public institutes to world-class status. Others who got the honour are IIT-Delhi, IIT-Bombay, Indian Institute of Science (IISc), BITS-Pilani, and Manipal Academy of Higher Education. Sounds great up to this point, doesn’t it? But if you are wondering why on earth you never came across a single photo of Jio Institute in your endless searches on Google or hear any mention of it, here is the hard truth – Jio Institute exists only on paper; it neither has a brick-and-mortar setup nor any virtual presence. Everyday 100s of students in Ahmedabad take the Bullet train in the morning to attend their college – the JIO Institute in Bombay. The students didn’t need to take an Education loan coz the heavy tuition fees was paid out of the 15L amount they rcvd last year. But the icing on the cake is Twitter handle @Jiolnstitute, which is of course a parody account. Extremely “happy” at having received the coveted tag of ‘Institute of Eminence’, the Twitter account not only thanked HRD Minister Prakash Javadekar but also made people go ROFL with sarcastic tweets. 1. Promises – they keep this nation afloat. Thank you Javadekar ji for granting jio institute An Institute of eminence tag. We will build the University together before 2024. 2. You can’t see me! Jio institute prides itself in that you can’t even find it on Google. 3. Is it tough getting into Jio Institute? Not at all, folks! 4. Mitron, please welcome your V-C! 5. Even Chanakya will apply for this course. 6. Those WhatsApp forwards will be meaningful now. 7. This is what is meant by ‘staying connected to your roots’. 8. THIS invention. Those nerds in the IITs are Jon Snows. 9. This is for those who were talking of crony capitalism. Instead of taking1000 crores from Government, We will give them 2000 crores for Party fund. 10. The perfect example of the Thanos principle – no people, no problem. Our campus is free from any type of Discrimination, because there is no Campus. 11. A lesson for all institutions on how to truly implement the Swachh Bharat Abhiyan.